There are several accounts in the English language about the person Isaac Da Costa. I’ll give some resources I found. There’s more to find, but I also came around accounts with errors. I’ll share with you something more from the Dutch resources I have. And I will try to frequently quote his own words although, of course, translated. 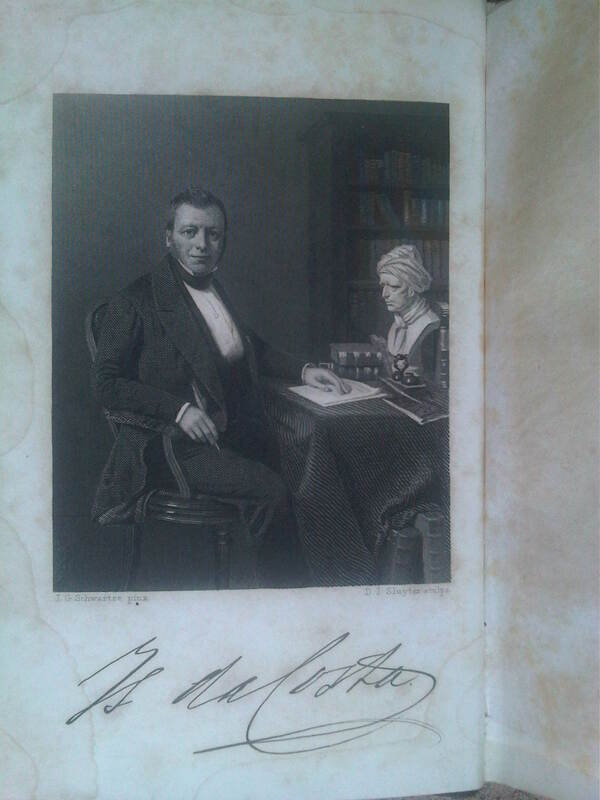 Da Costa’s acquaintance with Bilderdijk was in 1813 when Da Costa attended a society of Dutch Jews[i] in Amsterdam. Bilderdijk was one of the first members of the society and in that time (1795), when many Jews were improving their knowledge in gentile History and Arts, he sought to teach them about the false doctrines of the French Revolution and on the other side of the advance of the Torah given to the Jews. [ii] Da Costa: “Did he [Bilderdijk] succeed? So much is sure that although for one heart, for one life, for one son from the people of Israel which our great Poet had so much love for because of their Fathers but most of all because of their crucified גואל (deliverer), for one it caused an eternal blessing.”[iii] As Da Costa said about himself in his biography of Bilderdijk, De Mensch en Dichter Willem Bilderdijk. The following is also extracted from this book. As a 15 years old boy he gave his Hebrew teacher (Moses Lemans) a poet hewrote, and so it came before the eyes of Willem Bilderdijk. And by an arrangement of the teacher he met Bilderdijk. At that time Da Costa had many questions himself. Had the God of Israel been really revealed? To his fathers? Were there indeed Godly man who did miracles and signs and received Godly words? Did the Tenach really exists because of Divine inspiration? In these circumstances he met Bilderdijk. Da Costa was a very brilliant student and he very frequently visited Bilderdijk. Bilderdijk became his personal teacher and a great friendship was developing.